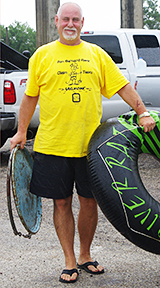 A successful cleanup was declared by Chairman Russell York who reported that ten boats, two jet skis, and three collection stations of volunteers filled a commercial-size dumpster with trash collected from the river at the annual Friends of the River San Bernard Cleanup on Saturday, Sep 13th. 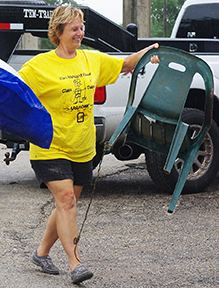 << Russell, shown here, looking more like he’s going tubing, unloads trash at the Churchill Bridge collection station assisted by volunteers Marilyn Shockley, Susan Bailey and Mike and Barb Pudlo, pictured below. Thanks to all the hard-working volunteers who care enough about the San Bernard to participate in this important FOR event that made the river a cleaner, healthier and more beautiful place to enjoy. Thanks also to Phillips 66 for donating the yellow Clean Team t-shirts.